Most parents love to run their fingers through their baby's hair whether the baby has a lot of hair or is practically bald! However, when it comes to grooming and taking care of your baby's hair, merely running your fingers is not enough. What you need are a quality hair brush and grooming kit. Your baby's hair is quite different than your own, as I am sure you already have noticed. Babies have softer and wispier hair when they are born compared to when they are older. Another interesting fact about a baby's hair is that almost all of the hair that the baby is born with will be shed in time to come. As a matter of fact, by the age of around six months, babies have an entirely new set of hair, hence the term "hair today, gone tomorrow"! So, if your baby starts losing hair, there is nothing to panic about, it is only natural. That said, one of the most common hair related issues that many babies face is 'cradle cap.' If you don't know what this is already, let me elaborate a bit and trust me it does relate back to the topic at hand, so bear with me! So, a Cradle cap is a condition that causes the scalp of the baby to become dry and scaly. If you are a new parent, the sight of flaky scalp skin can be quite intimidating. Most babies will have a cradle cap at some point and to a varying level, so there is nothing to be particularly alarmed about this. However, the conditions can be easily remedied by, you guessed it, gently brushing your baby's hair! 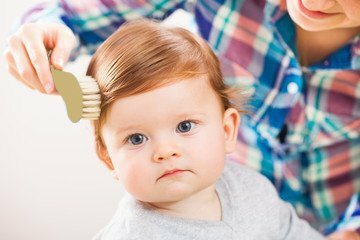 If you use the right kind of a brush, you can not only prevent the formation of a cradle cap but also stimulate hair growth. Brushing your baby's hair increases the circulation in the scalp and can boost the growth of thicker, lustrous and healthier hair. Not any ordinary hair brush is adequate for the delicate hair and skin of your baby. What you need is a special brush that is designed with the delicate hair and scalp of a baby in mind. If you choose the right kind of a brush, you can brush (and even style) your baby's hair with no worries and concerns. There are a ton of options on the market as well. However, as you can imagine, not all baby hair brushes are designed equal. While some do a fantastic job, others leave far too much to be desired. 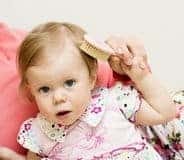 In this article, we will be talking about how you can pick the best hair brush for your baby and also take a look at some of the best one you can buy. With the natural baby hair brush set, you get three brushes for the price of one! The set comes with a premium hair brush with natural goat hair bristles, one deluxe massage hair brush with wood bristles and a wooden comb. All the brushes are made from a high-quality Beech wood which is the material of choice for making hypoallergenic and safe brushes. The goat hair bristles are soft and gentle on your baby's scalp. The message brush has rounded Beechwood bristles that make it an enjoyable experience for the baby as well. The brush set is designed to perfection as well. Both the massage and the hair brush is easy to hold and use. The handles are comfortable, and the brush is easy to clean as well. One of the best things about the Baby Bear products is that the company is actively involved in Save the Children Federation and donates a part of the profit to help children in need across the world. BabyLinos is a well-known brand of baby products, and their brush set does not disappoint even a bit. The brush set contains three brushes- a soft hair brush, a wide toothed brush for messaging and shampooing, and a wide toothed comb. All the brushes are made from high-quality wood and are extremely durable. The softer hair brush contains natural goat hair bristles that are gentle and soft. This brush is perfect for preventing cable scalp and styling your baby's hair as well. The message brush bristles are made from high-quality silicone that is hypoallergenic and soft. The rounded ends are just perfect for giving a gentle, soothing massage as well as clean the scalp while shampooing your baby's hair. The company provides a 100% money-back guarantee, no questions asked. So, if you are not satisfied with the product, you can get all your money back! There is just no good reason not to try this one out! Another great product from the well-trusted brand of OCCObaby, the 3-piece Baby Hair Brush set is well worth your time and money. The set comes with a hair brush, a massage brush and a wooden comb. While all the brushes are made from high-quality wood, the hair brush has natural goat hair bristles while the massage brush has wooden bristles. The soft goat hair brush is perfect for the day-to-day combing while the massage brush is good for occasional use. The ends of the massage brush are rounded and coated with a hypoallergenic plastic material. The brushes are easy to use and clean as well. Even the wide toothed wooden comb that comes with the set is high-quality. Royal infant baby brush is one of the best goat hair baby brush on the market. You get a set of two brushes in this set. While one brush has the softer goat hair bristles, the other brush is a wide toothed brush with plastic bristles that have rounded tips. The goat hair brush is great for routine use while the wide toothed brush is great for providing gentle and soothing scalp massage to your baby. Although the bristles are made from plastic, they are very soft, and the rounded ends are very comfortable for the baby. Use the brush to gently massage the baby's scalp and watch him/her giggle! The handle of the brush is also designed with great care and is comfortable to use. The whole brush is made from wood and hence has no static electricity build up as well. The company also provides a 100% money-back guarantee, no questions asked! The Royal Infant brush gets most of the things right and hence enjoys our strong endorsement! If you are looking for just a standalone soft bristle brush without the comb or a massage brush, the Natemia hair brush is perfect for you. It is a single wooden brush that has natural goat hair bristles. The brush is very easy and comfortable to use, and the bristles are soft and safe to use even on a new-born baby. The handle of the brush is made from high-quality wood, and the brush is easy to clean as well. It also has a nice finish and looks to it. What makes a great baby brush? As with any baby product, it is important that you choose a brush that is safe, easy and effective for your baby. There are some features that you must check out before making the decision to buy a baby brush. Here are the most important things to consider. The design of a hair brush is quite simple, isn't it? I mean all it has is a head that has bristles and a handle. As the bristles are going to be in direct contact with your baby's hair and scalp, they are the most important part of a brush. As a rule of thumb, you should go for a brush that has softer bristles if you have a child that is a few months to a few years old. The choice of the material used for manufacturing the bristles depends on the brand the price of the brush you choose. While the more affordable brushes contain plastic bristles, some others contain goat and boar hair as well. The animal hair brushes are much softer compared to the plastic bristles, and hence they are the best for a newborn or a baby up to, say a few months of age. These brushes are not that ideal for styling or combing your baby's hair. Plastic bristles, on the other hand, are slightly sturdier compared to the animal hair brushes. That said, some of the brushes with synthetic bristles also manage to keep the brush as soft as the other ones. So, when it comes to a choice between the plastic or animal hair brushes, it boils down to your personal preference and budget. The price is also an important consideration while choosing a baby brush. While some brushes can be quite expensive, some other cheaper varieties are also available on the market. However, as with most baby products, you do get what you pay for, and as a result, you should avoid the cheap ones. Trust me, I am speaking from a personal experience! One thing is clear; your baby is not going to use the brush by himself/herself unless he/she is superhuman, that is! So, it is almost certain that you are the one who is going to be using this brush on your baby's hair. As a result, the brush should be comfortable to hold and use for you. Some brushes are notoriously horrible at making the parent comfortable to use them. I mean they either have short stubby handles that are just too uncomfortable, or they have thin plastic handles that make using the comb an absolute disaster! So, pay close attention to the design of the brush. Make sure that the handle of the brush is ergonomically designed and is comfortable to hold. If the brush is not easy and comfortable to use, chances are, you are not going to use if often and it kind of ruins the whole purpose of a brush. As with most baby products, brushes can quickly get dirty and unhygienic. You don't want to use a grimy, dirty brush on the scalp of your baby. So, the ability to clean the brush quickly is a big deal, isn't it? Always look for a brush that is easy to clean and dry. I don't like brushes that are notoriously difficult to clean and trust me; there are plenty of those out there! Babies can be allergic to the bristles or the material of the brush itself. If you know that your baby is allergic to, say, animal hair, stay clear of the goat hair or boar hair brushes. There are plenty of hypoallergenic brushes out there. Look for the ones that have a hypoallergenic label on them. After testing the top five baby brushes on the market, the choice of the best one was not that straightforward. All the brushes that we covered here are almost flawless, but one particular brand was the better among the best. I am of course talking about the Baby Natural Wooden Hair Brush and Comb Set. The brush ticks all the right boxes and offers the best value for your money. The soft bristle brush is great for routine use, and it does not shed bristles at all during the everyday use, which is a huge plus. The massage brush also reflects the same quality and durability. If you are looking for a baby brush, Natural Wooden is perhaps the best you can buy! As always, if you like the contents of this article, do share and help us spread the word!